Date is exactly "1913 December 11"
Ellen writes to Jessie on her honeymoon to update her on the family news and social engagements. She mentions that they are still receiving gifts and notes about the wedding. She also writes about some jewelry that she has purchased/received. 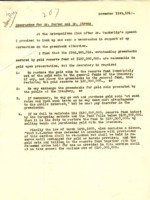 A memorandum on greenbacks and the gold reserve. Benjamin Strong Jr. writes Elihu Root concerning American securities in Europe.